How to Remove Junk Files on iPhone X/8 Plus/8/7/7 Plus/6S Plus/5S? You don't get it. When you first got your iPhone, it operated faster than all previous smartphones you ever had combined. Its performance was as smooth as silk. What's more, it could operate multiple apps all at the same time and wasn't leggy or unresponsive at all. But now your iPhone has become slow to respond and keeps on telling you that you no longer have enough storage space to download the latest update to Gmail or not even enough to download a song from iTunes. This is because your phone has created so many junk files as you navigate the web, frequent certain web pages, use certain apps more often and upgrade the operating system without cleaning it first. And even though there are many smartphone cleaners available on the market, downloading those apps can add more data to your phone and take up just as much storage space. It may not even be worth overloading your iPhone with an app that can't clear up enough space to make up for the amount it takes up on your smartphone. Luckily, Coolmuster iOS Cleaner or iOS Cleaner for Mac is a program that can remove junk files from your smartphone without ever having to download another app to help doing the cleaning process. This program is available for you to free download on your Windows and Mac computers, and can remove all junk files like caches and temp files from iPad, iPhone and iPod. 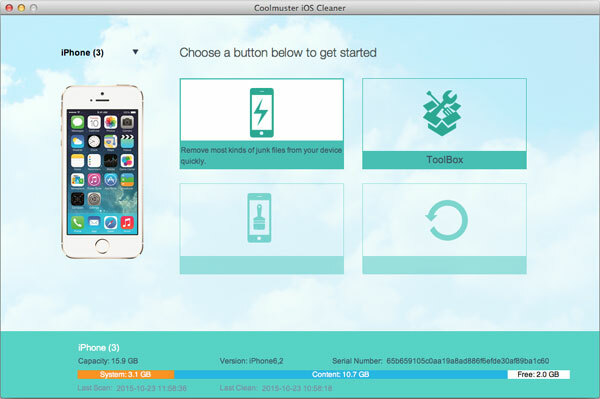 Once you connected your iPhone with the computer, Coolmuster iOS Cleaner will scan your iPhone deeply and quickly to find the target junk files. It not only gives you the capability to remove junk files, it also allows to you choose which files you want to save from deletion on your iPhone before you clean it. It works on all iPhone models like iPhone X/8 Plus/8/7/7 Plus/6S Plus/6S/6 Plus/6/5S/5C/5, as well as iPad and iPod. Just click the button below to free download the demo version of the iPhone data erasing software. Choose the right version according to your computer system. Connect your iPhone to your computer. After you have downloaded the software, click on the icon that pops up on your desktop. When it opens, you will see a window of the program shows like the following picture. It will detect the connected iPhone and show it on its window. When you are ready, hit the "Start Scan" button and iOS Cleaner will scan your iPhone for all junk files. After the scan, it will then list all the files it is able to delete and still allows you to preview these files to see if you want to keep them or not. Finally, when ready, click "Erase" button and wait for the confirmation screen telling you how much data was erased as well as how much space you created. - Open your iPhone and double press the Home button. - Now thumbnails of all the opened apps are displayed, drag each to close the corresponding one. - Press the Home button again to go back to the normal view, Then use your iPhone normally with better performance. - Go to the Home screen, and tap the Settings icon. - Locate and tap the Safari app from the Settings window. - Go to the Privacy & Security section from Safari window and tap Clear History and Website Data. - Tap Clear History and Data option on the promo dialogue. - Tap the Safari icon from the Home screen. - Choose Bookmark icon from the bottom of the opened Safari’s interface. - Now tap History from the displayed list. - Click on Clear option at the bottom. - Finally, clean up files as wanted by choosing the right option. 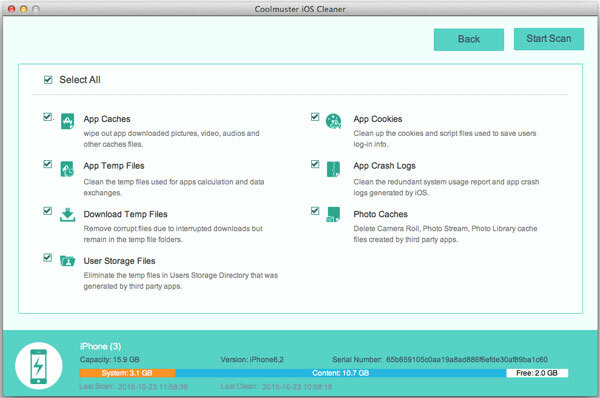 Note: We kindly suggest you remove junk files from iPhone from time to time by using this Coolmuster iOS Cleaner in order to make sure your iPhone can run fast and smoothly.